Sometimes you want to slice an apple now, but eat it later. You may be packing a brown-bag lunch or snack for yourself or your kids, or you may just be prepping ahead of time for an apple pie or other fruit-heavy dessert. Unfortunately, once an apple's skin is penetrated, its cut surface starts turning an unappetizing shade of brown. With a few simple tricks, however, you can forestall this process and preserve the look and taste of your fresh, crisp apple. Cut apples start to turn brown due to a process called oxidation. When the oxygen in the air comes into contact with certain enzymes in the flesh of the fruit, they react with each other. The resulting new compound is brown in color. This process is similar to why iron rusts. The fewer cells that are crushed while cutting your apple, the less enzyme is available to react with oxygen and cause browning. A sharp knife will minimize crushing; thus, a sharper knife can help prevent browning. 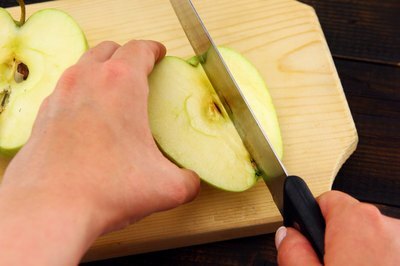 There is another reason to use a sharp knife: Pressing sliced apples back together after cutting will help prevent oxygen from reaching the cut surface, and sharply cut slices fit together better than those cut with a dull knife. Sometimes, slicing and reassembling your apple, showing no exposed cut surfaces, is enough to keep browning at bay for a few hours -- long enough to reach lunch break, at least. Lowering the pH of the apple surface with an acidic substance can help slow the browning process. 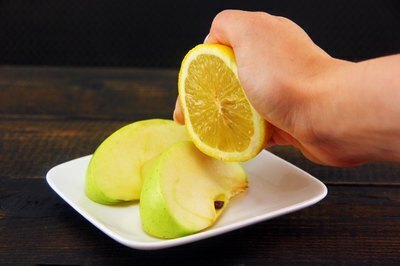 Dip apple slices in lemon juice or sprinkle the juice on top of the slices to boost their acidity and prevent oxidation. Other acidic fruit juices, including lime juice, orange juice and pineapple juice, will work as well. This, by the way, is why apple chunks in a fruit salad don't turn brown, so if all else fails make a fruit salad with orange sections or pineapple chunks included and your apples will stay fresh and bright. Vinegar works as an acidifier, too, but the resulting taste may be too off-putting. If lemon juice isn't handy or you don't like the way it changes the taste of the apple, try sprinkling cut slices with ascorbic acid powder. Ascorbic acid is another name for vitamin C, and the powdered form is often sold in pharmacies and health food stores. 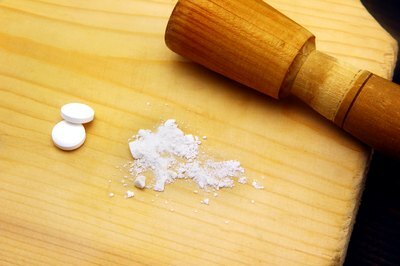 You can also crush vitamin C tablets into powder in a pinch. Like fruit juices, ascorbic acid powder acidifies the cut surface of the apple and thus slows down browning. Browning only occurs when the cut surface of an apple slice comes into contact with air. Therefore, if you keep the air away, you'll prevent browning. 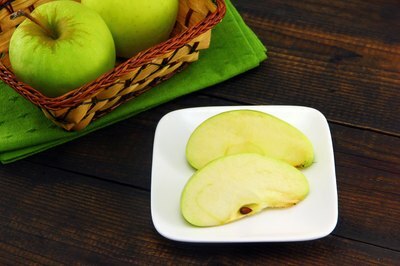 Submerge apple slices in water -- add a little lemon juice if you like. This method works especially well if you're planning on cooking the apples within a short time, but it can also be used when packing a lunch. Just make sure your container is leakproof. 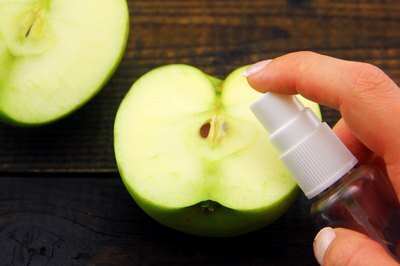 You can buy commercial anti-browning sprays or powders and use them on your cut apples; they're generally primarily made up of ascorbic acid. Their major selling point is convenience. 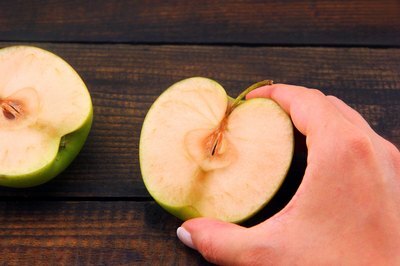 Scientific American: Why Do Apples Turn Brown After Being Cut?